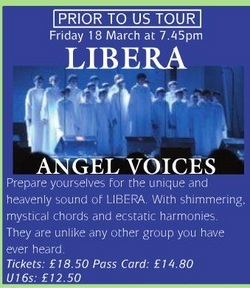 On March 18th, Libera held their first concert of 2011 at Epsom Playhouse, in Epsom, England. Twenty-three boys performed to a sold out crowd of about 450 people at the concert, which began at 7:45pm. The tracklist has been changed significantly since their last concert in Beverly, and now includes their new song "Song of Life" as well as several old favorites! Henry Barrington, Jonathan Barrington, Tiarnan Branson, Jude Collins, Luke Collins, Liam Connery, Kavana Crossley, Jakob de Menezes-Wood, Dylan Duffy, Daniel Fontannaz, Freddie Ingles, Matthew Jansen, Stefan Leadbeater, Alex Leggett, Barney Lindsell, Eoghan McCarthy, James Mordaunt, Samuel Moriarty, Cassius O'Connell-White, Ben Philipp, Matthew Rangel-Alvares, Carlos Rodriguez and Ralph Skan.